Thai cuisines have very strong flavors. They are delicious, but somehow make Thais to get use to and do not aware of strong flavors. A lot of time that too much of seasonings can lead to health issues. Salty food can harm our body system. It contains sodium. Too much sodium in the body can causes high blood pressure and chronic kidney disease. Salinity of the food is qualitative information, varying depends on personal opinion. 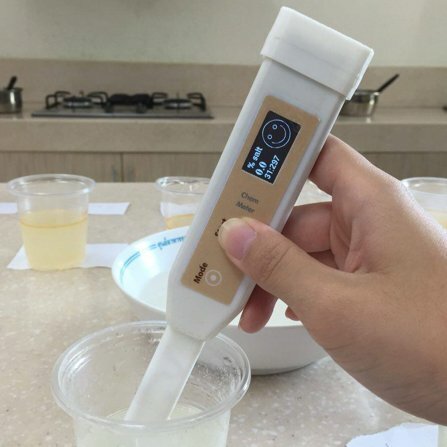 The food salinity meter in this research, Chem meter, can measure salinity in dishes and display the results as a percent of salinity and emotion face for better understanding of normal people. It would let users aware of the salinity of their food. So that people can check for appropriate diets for themselves. Currently, this research is continuously developed to have add-on modes for variety of dishes.